Things are getting pretty hairy around the SendGrid offices…literally (not in the chaotic use of the word, but in the moustache, soul patch, goatee, mountain man beard sense). 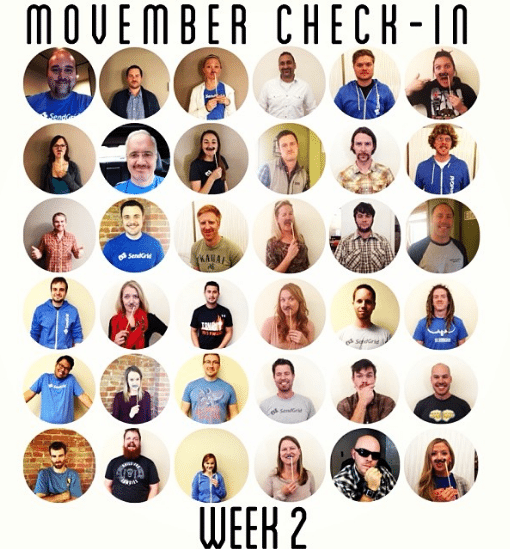 We have an incredible 52 internal Movember participants this year and let me tell you, they are off to a great start! This year, we are embracing Movember in a three pronged approach—internal moustache/beard growing, an internal health challenge, and a Share the ‘Stache initiative for everyone to be involved with that ultimately results in a donation to the Movember Foundation! If you’re familiar with SendGrid, then you are familiar with the 4Hs we eat, sleep, and breathe. Healthy just so happens to be our unofficial “5th H” and also a key motive of Movember (aside from the glorious whisker growing). 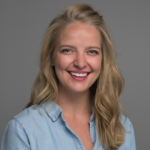 So in the spirit of staying healthy and active, one of our kickass engineers, Seth, created an interoffice fitness challenge Count My Reps utilizing our Parse API. Stay tuned for our post detailing how he created the app using SendGrid and the current standings between the offices. Feeling inspired to get in on the Movember action?? We have just the thing for you. 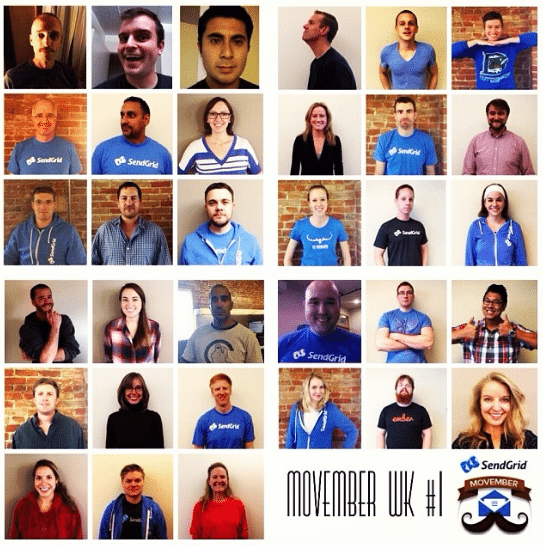 Click on the link below and share our SendGrid ‘Stache! Every share means more money for the Movember Foundation. Just a few quick clicks can help change the face of men’s health—so get to it friends! SHARE THE SENDGRID ‘STACHE NOW!